As I mentioned yesterday, I have finished my second skillshare! And it feels so nice. 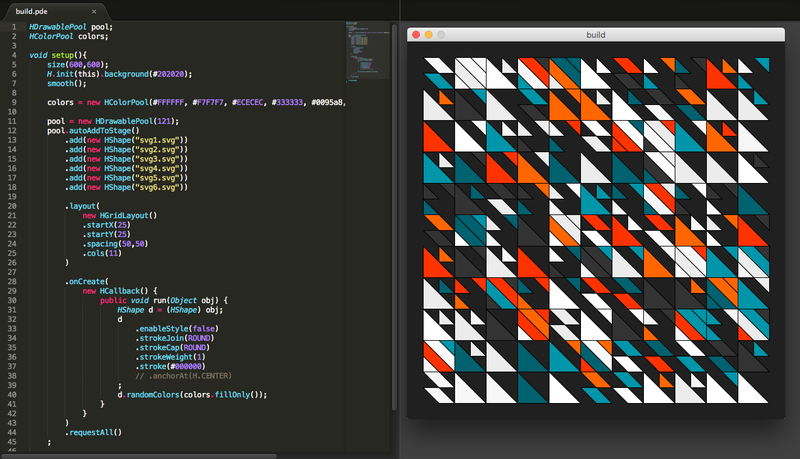 This one was about using Processing and a framework called Hype to create randomly generated art using code. 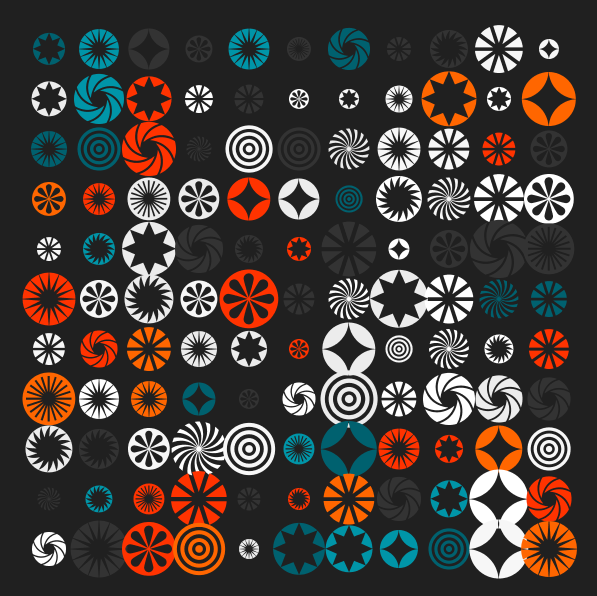 I have always been interested in generative art - it's really very fascinating to be able to create visually pleasing pieces at random using a predefined set of parameters. Joshua Davis is a designer with a very interesting background. He is the purest example of cutting your own path in this world, which is especially important in the field of design, considering the fact that the field is intensely saturated with people who all do the same thing. (Bitter, much? Haha...) Coming from the world of Flash, Joshua wanted to have the ability to design animations that could develop with whatever software was becoming prevalent. As Flash began to peter out in its popularity (for a number of reasons), he noticed that Processing was becoming popular (and that it did some very similar things to Flash). The only problem was that as Joshua began to tinker with Processing, he found that it wasn't as straightforward for image manipulation and creation as he would have liked. Especially because Processing is marketed primarily to designers, Joshua knew there must be a better way. Through this channel, he and a man named James Cruz created Hype. Hype is a framework for Processing through which designers can create things much more quickly and easily than in Processing alone. There are lots of examples, and with some previous knowledge of Processing, you can get going with Hype in under a day. This is a matter of preference, but I highly prefer to write Processing inside Sublime Text. I can auto-complete things, I can select multiple things at once, copying and pasting is a dream, and you can even run a Processing sketch from Sublime Text. Really, really cool. Windows computers already have this built in (you win this round) but I needed it for my silly old Mac. SizeUp will resize your window to any configuration you want using keyboard shortcuts. Left, right, top, bottom, center, full, any mixture of those, and even more. I am always resizing windows to tile them horizontally but now it takes me half of a second to do it. Simple, but fantastic. Joshua shared a very intense color picking tool that will give you an excellent swatch of colours based on an image. And the best part – it's meant to be used in conjunction with Hype. 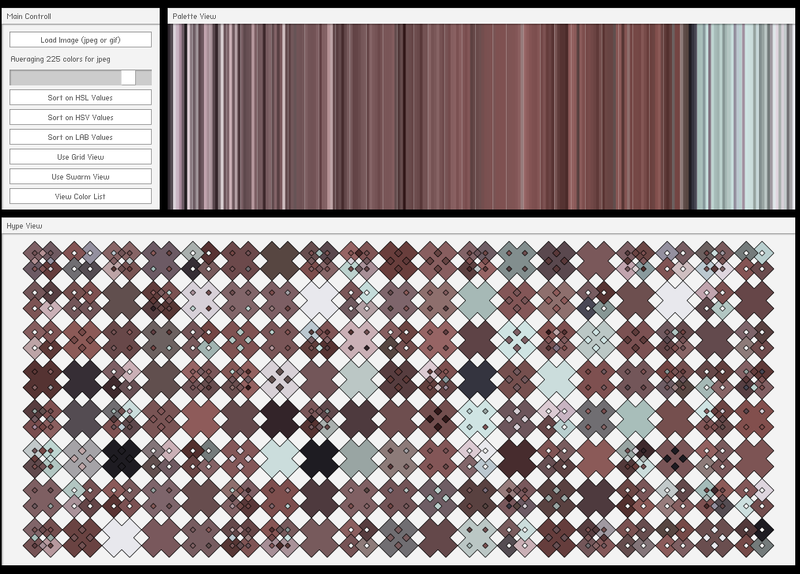 It can output hex codes in exactly the right format to copy and paste into your code, and it has a viewer that allows you to visualize your colours into not one, but TWO examples of a Hype layout. Now that's some forward thinking. Inside Illustrator, command + h will hide the outline of a selected object. This is super handy when you have a lot of things selected and you want to see how they layer using different blending modes. I love it. I want to use the skills I have learned in a project that will really cement them in my mind. While I love randomly generated art, why not push the concept a little further by introducing statistics into the equation. Instead of randomly choosing a shape, why not assign the shapes a value and have their appearance mean something? In the piece above, each of the shapes is representative of a cause of death that is most prevalent in Canada. For example, a few would be malignant neoplasms, Alzheimers, or diabetes. The more times that a specific shape appears, the more common that type of death was in a specific set of time. Colour represents the province in which a death happened, and size relates to how many deaths occurred. So you can see that even though the piece feels random, it is actually driven by data and can tell a story of a bigger picture, while looking aesthetically pleasing at the same time.